Last week, Catherine and I went out to see “Interstellar” using free points racked up on my ScotiaBank (“We’re richer than you think”) debit card. Since we had not had dinner, we headed up to Stepho’s, a Vancouver Greek restaurant with generous portions and low prices (Their price for a 1/2 souvlakia has increased by $2 since 1989). This was already an awesome date, with dinner and a movie, but what really made my night is when Catherine returned from the ladies room and presented me with this awesome ant. 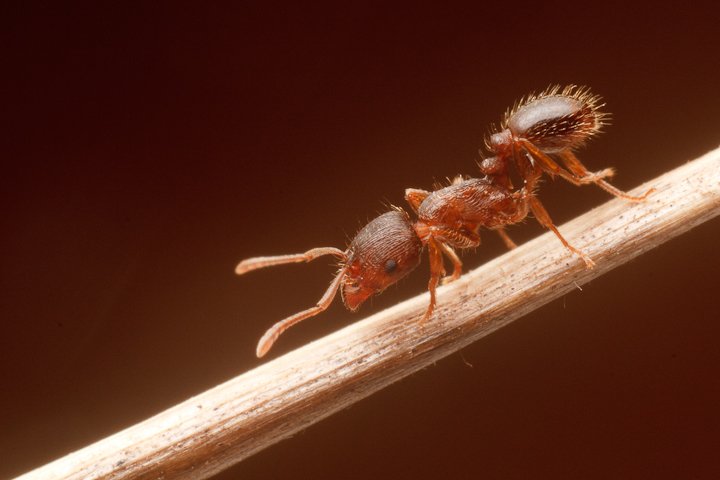 I identified this as Tetramorium species E, what is commonly known as the pavement ant. This is an introduced species or member of one of several introduced species that is quite common in some cities in BC. I have found that populations are most dense in the suburban sprawl of Richmond. Thinking to photograph her after the movie, I imprisoned her (the ant) in a pill bottle and sprinkled some wetted sugar into the container to keep her sustained. I then promptly forgot about her until this morning! To my surprise, she was still alive, and so I set up a macro rig consisting of the Canon 50mm on 62 mm of extension tubes capped off with the Raynox DCR-250. I photographed her on a piece of grass against the wood floor at f16 and ISO 400 using a diffused YN-560 at 1/4 power. 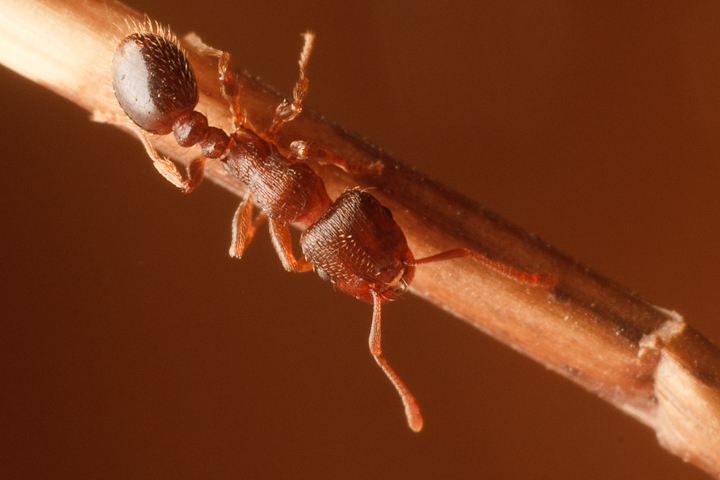 These myrmecines do not move very quickly. 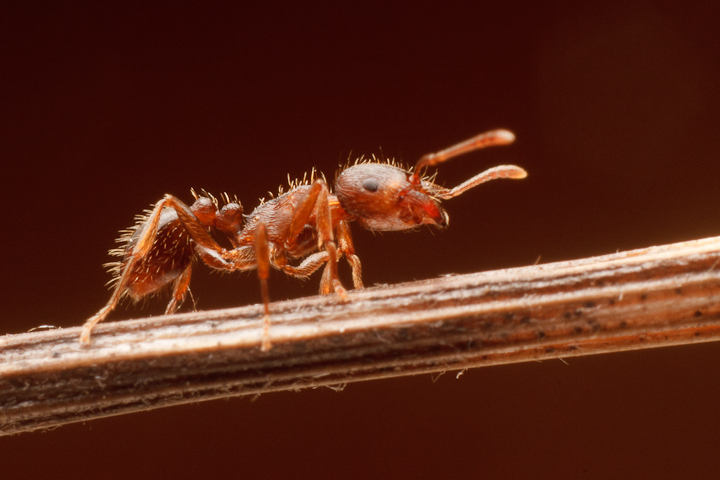 They are quite aggressive with other ants though, and are often seen engaged in major battles during the summertime. 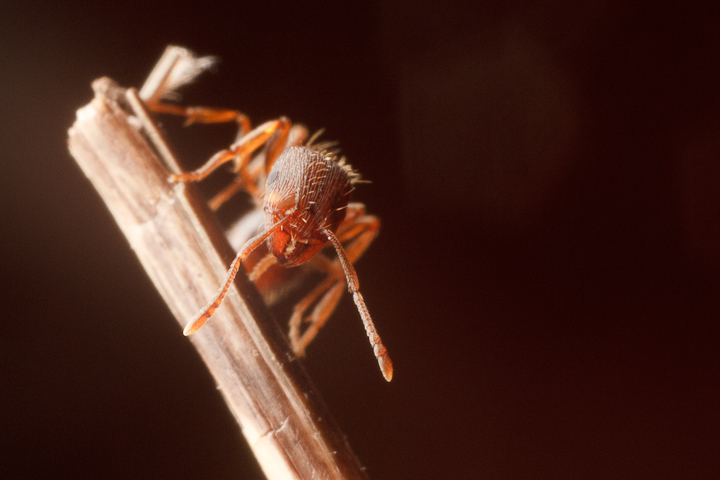 You can see the out-of-focus highlight to the right of the ant is pentagonal, due to the 5 bladed aperture of the inexpensive Canon lens. The constrains of the close subject distance meant that the flash was positioned somewhat behind the subject, but I like how this highlights the setae. The future looks bleak for this individual, as she is now parted from her colony, which is probably huddled in a little ball somewhere below the ladies room of Stepho’s. I will continue providing her with sugar as long as she lasts though, and maybe try some more shooting later on. 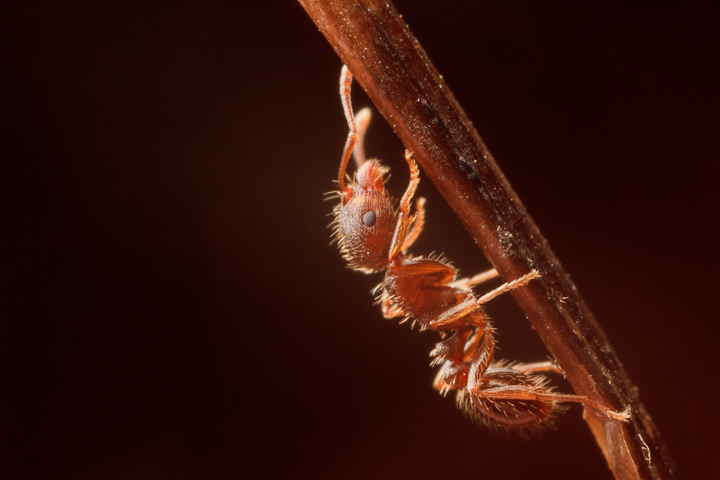 This entry was posted on November 29, 2014, in Natural History and tagged ants, dating, Interstellar, photography, Tetramorium. Bookmark the permalink.